This thing was all over the web recently. I was hesitating if I should follow and put it here. 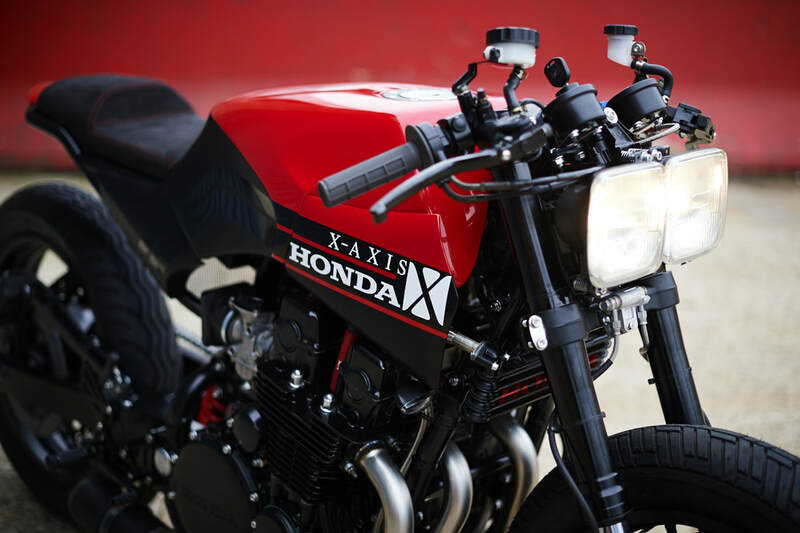 I decided to do it – for 1 reason: it’s really not often when You see a CBX750 modified. 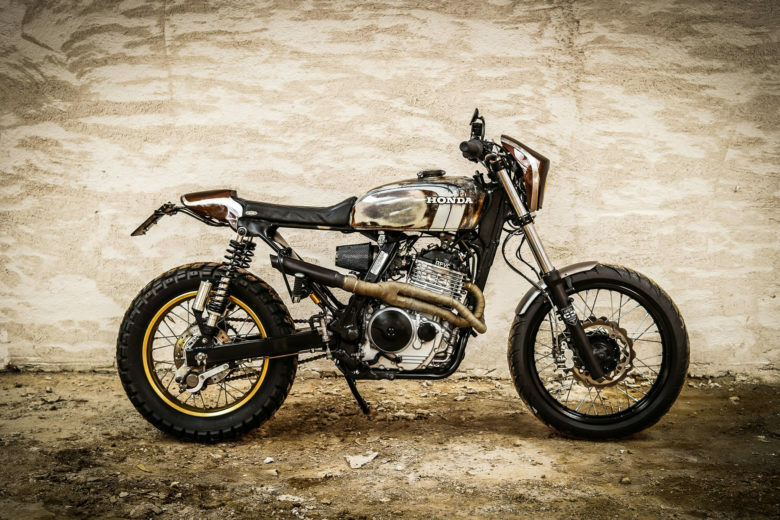 Most of the builders go for a “regular” CB. 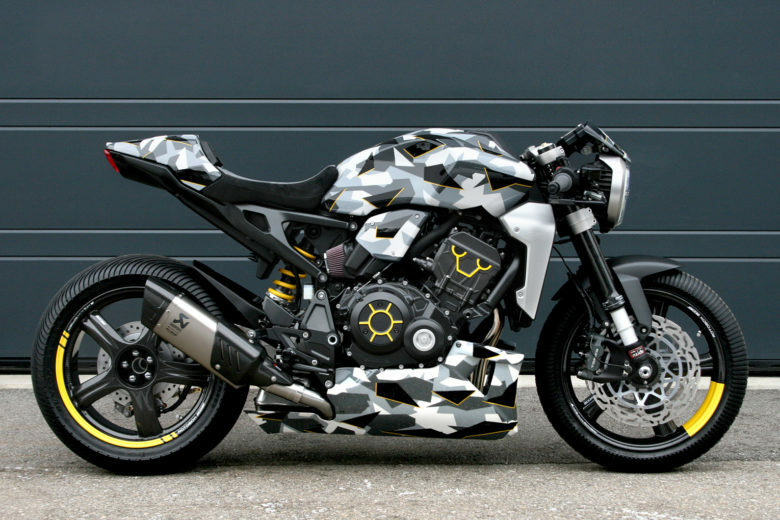 The CBX seems to have “The Katana” vibe to it. It’s weird (for its time) and controversial. Both of these are not often stripped down from fairings successfully. 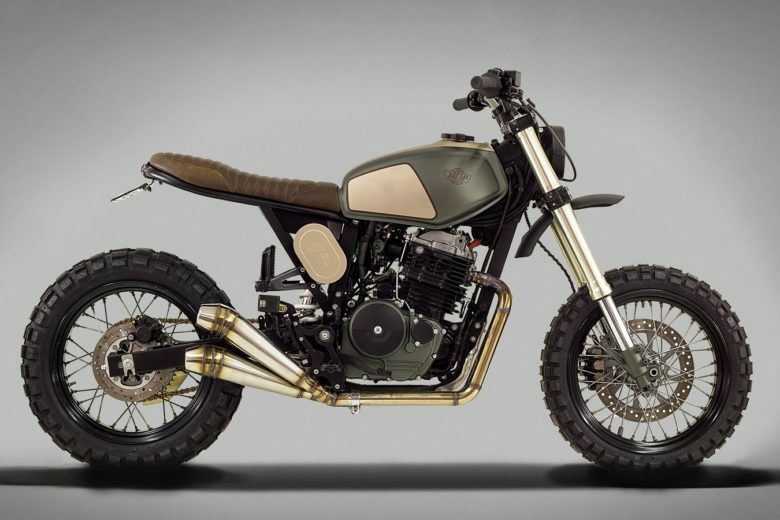 It’s not a general cafe racer styling, but it has some nice and unique features to it, that a real petrolhead will appreciate. 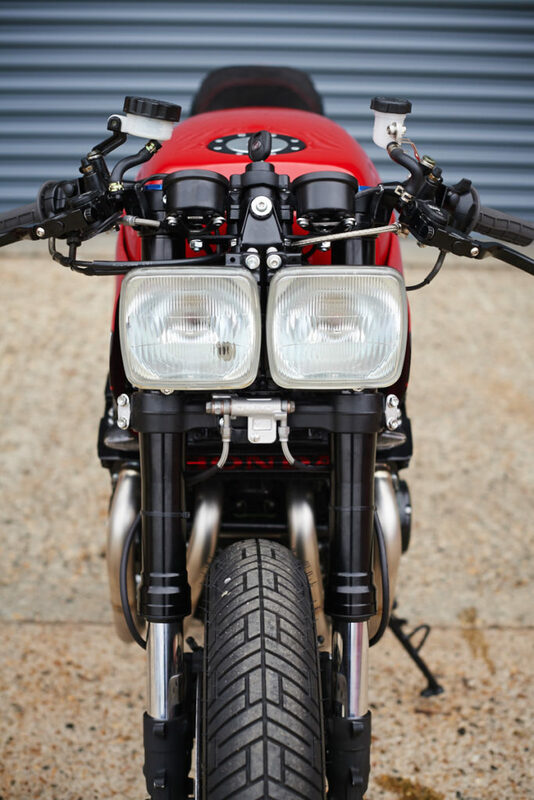 This particular CBX comes was built in 1984. The front end comes from the 2014 CBR600. 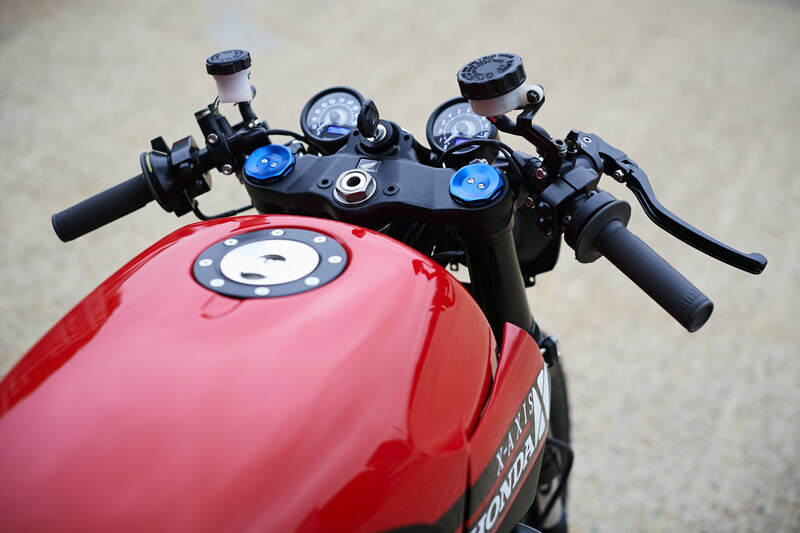 But the team decided to leave the original wheels, so they had to fabricate some custom spacers to fit the brakes from the modern sports bike. 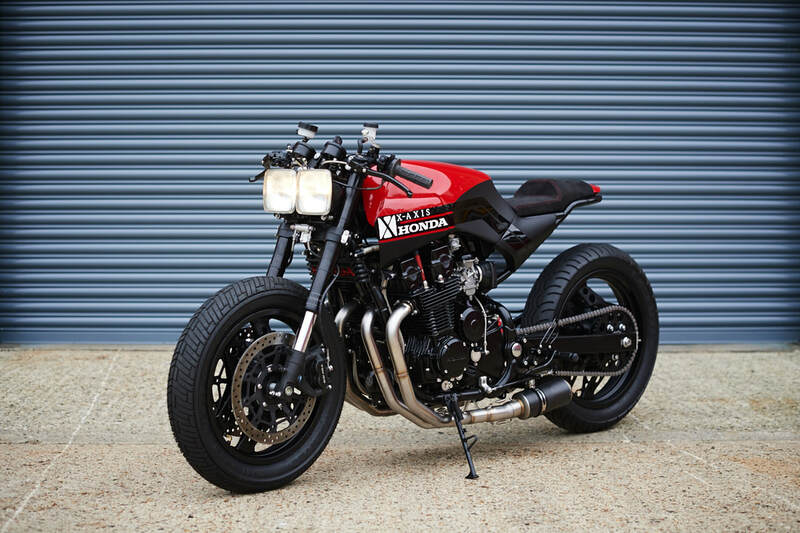 There is no point in having a bike looks good if it doesn’t ride well. 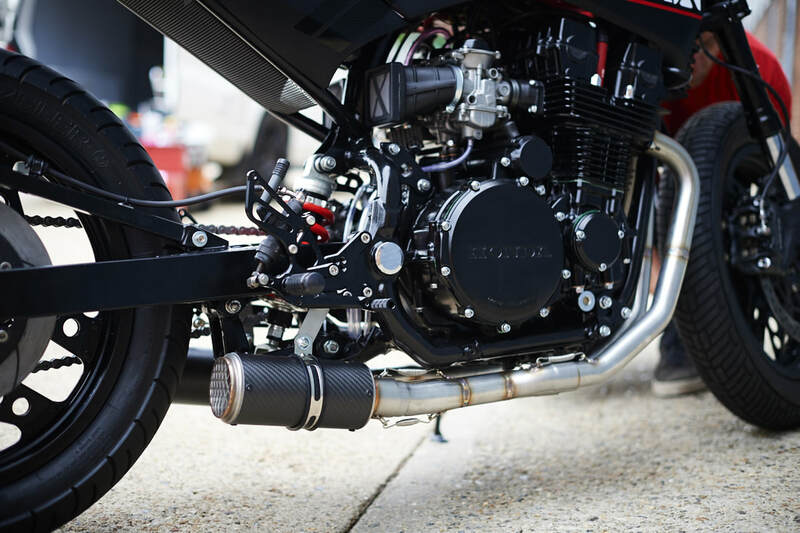 This particular engine was completely rebuilt and improved by a TT racing mechanic: Guy Amor. 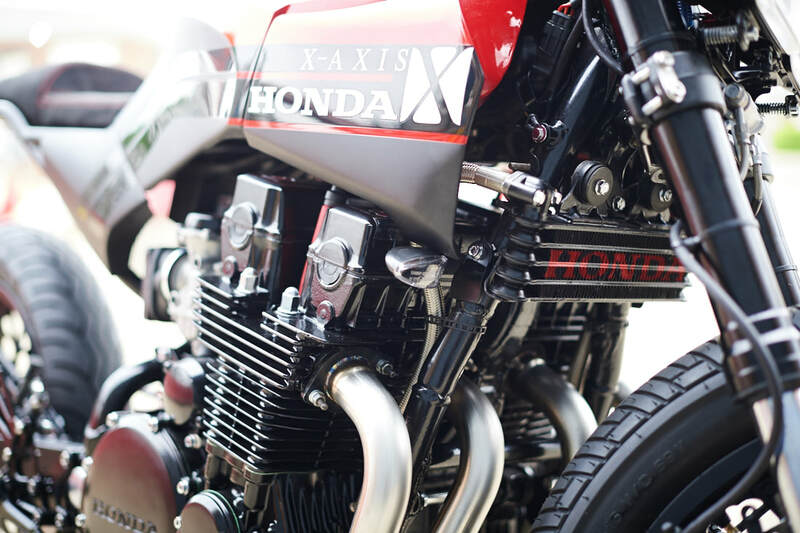 I just love the Honda CB engine looks. All its air-cooled editions are very nicely designed. Not only by their appearance but also from an engineering perspective. They are small and sound beautifully. 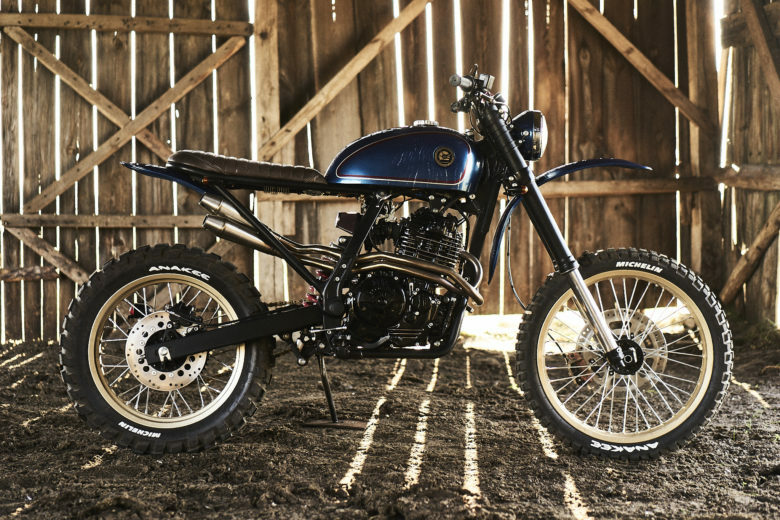 Put one next to a Suzuki GS750 – and You’ll see the difference in size. All new bearings top to bottom, fully blueprinted including a lightened and balanced bottom end, new pistons, rings, bearing shells, clutch, NGK spark plugs. 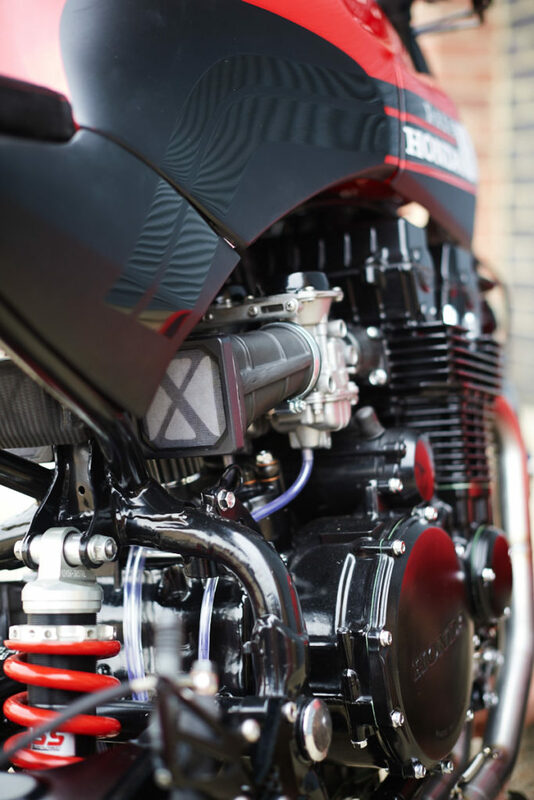 Guy’s hand built engine allows for much tighter tolerances than a mass produced production engine, and a mechanic with the race level experience of Guy Amor I can confidently say it is the defining feature of the performance we have created from the CBX and one of the best CBX rebuilds around. Carbs were left stock (rebuilt of course), equipped with hand-crafted custom air filters on the intake side. 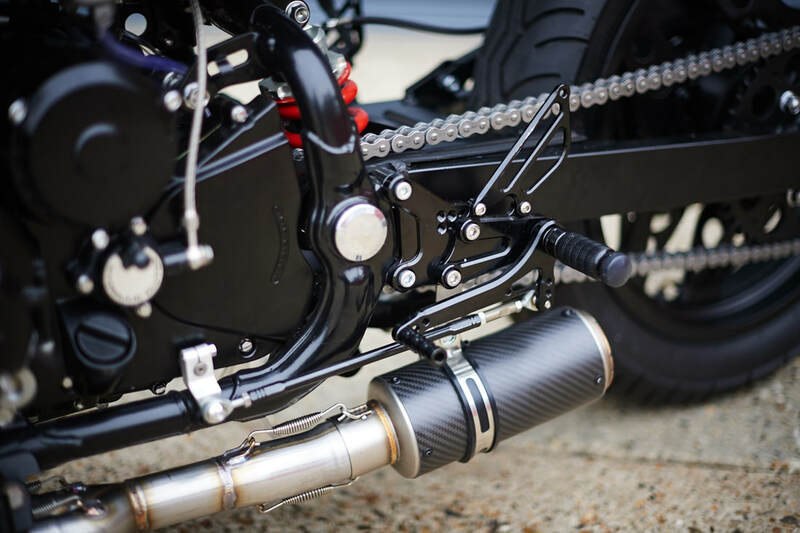 The entire exhaust system was custom built by DEP pipes. The rear shock was switched with a quality YSS replacement. 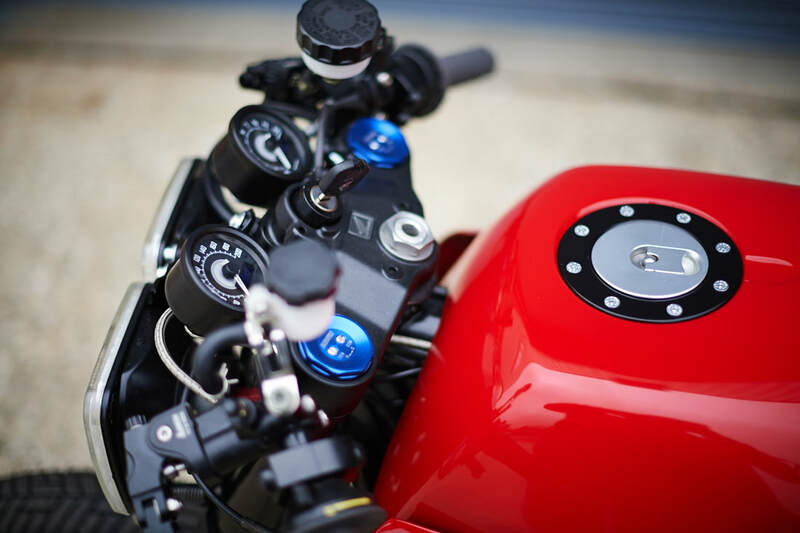 Wiring was completely rebuilt with modern technology (of course: Motogadget is on board – their M-Unit just is irreplaceable when it comes to losing weight, simplifying and hiding things). X-Axis decided to leave the original twin headlight. Which obviously looks quite unique. It’s nothing like we’ve seen before – and I love the fact they appreciated it’s originality. You don’t get many of those originating in the 80’s. 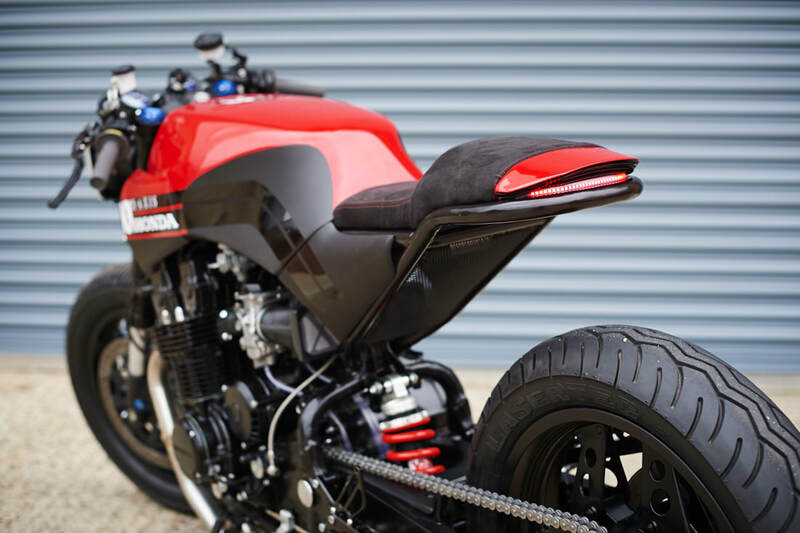 Custom made tail is designed to match the proportions and keep things simple. Finished with Alcantara and LED taillight. Daytona gauges finish the looks. The result – is a truly unique machine. 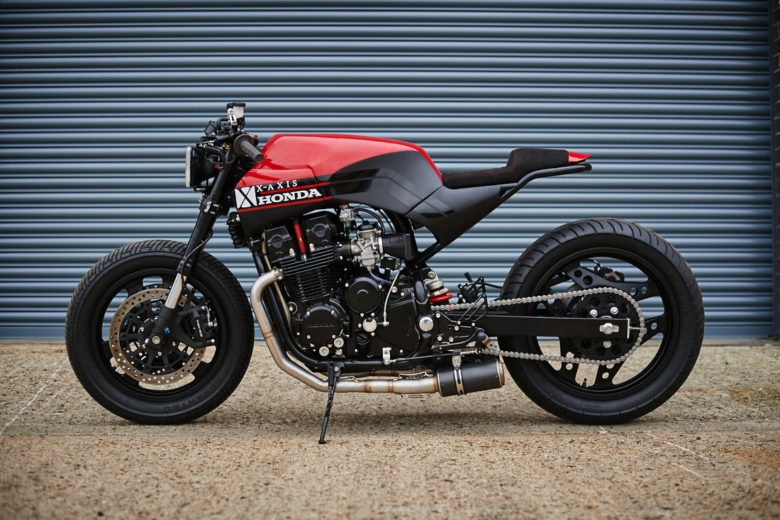 I know that the reviews are mixed – especially from the orthodox cafe racer fans. It’s either: love it or hate it in this case. But You cannot deny that the brave choice of a donor bike – paid off this time. If You don’t appreciate the looks – think about the engine rebuilt and the “performance” focus. Personally – I like the whole package.